I think I am all set for teaching my first beginner’s sewing class at the local Joann’s today. I use a tackle box instead of a sewing box. This one is huge, 4 layers. I have had it for years. I checked on Thursday and there was only one girl signed up for classes. If that is still the case I am taking the Bali Pop purse project to start sewing. It is in the basket with the ironing stuff. 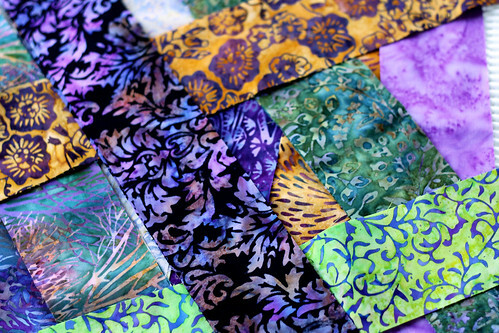 The second photo is of a few of the batik strips. There are 40 different ones in a Bali Pop package. 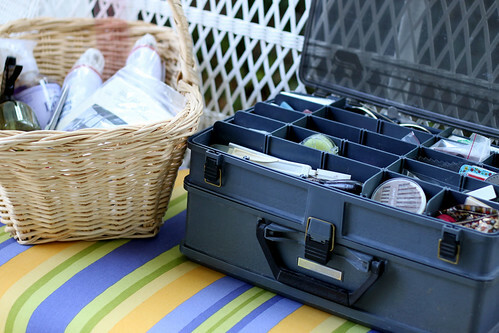 Much prettier than a tackle box of sewing notions. This entry was posted on Sunday, August 2nd, 2009 at 3:00 am and is filed under Sewing. Tagged: Sewing. You can feed this entry. You can leave a response, or trackback from your own site. Using a tackle box is a smart idea. I’m sure it’s cheaper than a sewing box and all those compartments are just perfect! Have a great class today! I took a sewing class years ago at Joann’s and it really helped to send me on my way with sewing. Just think – you are about to do that for someone!